Afraid of digital disaster, or want to pursue a career in Bioinformatics? Attend the Bioinformatics Workshop to accentuate your knowledge and skills in one of the most emerging fields of Science! 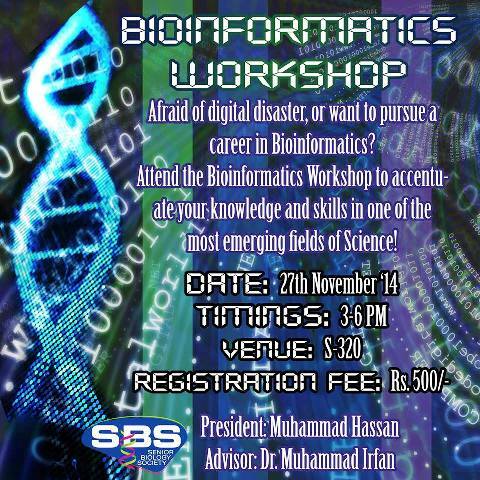 SBS will organize a workshop that will help attendees grasp the breadth of possibilities in the field of Bioinformatics. The workshop will be conducted by Dr Aftab Bashir and Muhammad Adeel, and will cover following topics: Databases; BLAST: Principles and Applications; Alignment and Software; Signal P/Protein Localization; Accessing PDB and protein structure; Usage of Visual Molecular Dynamics; Gene Analysis; Protein Characterization; Expressed Sequence Tag-Orthology Groups; Making Synthetic Genes and Bioinformatics in Disease Diagnosis. 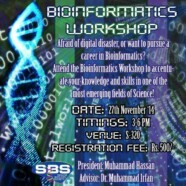 Please fill the in the registration form to register for the Bioinformatics Workshop. The registration will only be finalized with the fee payment. You may pay your registration fee at the registration desk at Armacost (S-Block) entrance from 24 November onwards. For more details: Visit www.facebook.com/SeniorBiologySociety or our Information Desk at S-Entrance.